Coaching trailblazer and distinguished servant of Welsh rugby Ray Williams has died aged 87 after a battle with cancer. Williams was presented with the IRB's highest honour, the Vernon Pugh award, in October for his services and positive contribution to the sport. After a playing career that saw him represent London Welsh and Northampton, as well as having trials for Wales, as a fly-half, Williams became the first full-time paid coaching official in the world game in 1967. He is fondly remembered for coming up with the ideas and strategy that saw Wales dominate European rugby in the 1970s. The squad system still used today was his brainchild and was soon being implemented the world over. Following the sad news of the death of Ray Williams, we revisit John Taylor's recent column paying tribute to one of rugby's true innovators. 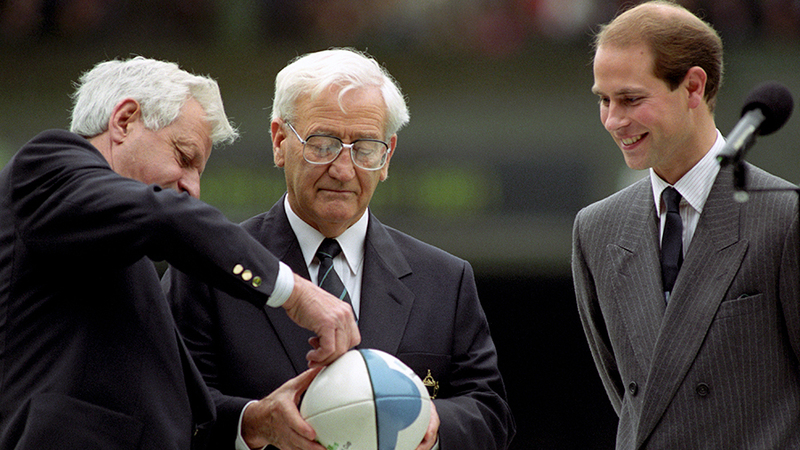 "Ray changed our perception of the view we should have of rugby football in the future. He tabulated the essential ingredients of the game in which he was involved so deeply and went on to preach his rugby gospel all over the world," said Wales great Gerald Davies, who presented Williams with the Vernon Pugh award in October. "He did nothing less than to cause a revolution in the game. It was the bringing together of coaching ideas and physical preparation in a way that had never been done before and the world came to Wales for his coaching courses and to listen to what Ray Williams had to say about coaching." Williams was appointed WRU centenary officer in 1980 and later became secretary. He sat on the board of the WRU and IRB between 1993 and 1997, was chairman of the Lions committee in 1997 and tournament director of the 1991 Rugby World Cup. Upon giving Williams the prestigious Vernon Pugh award, World Rugby chairman Bernard Lapasset said: "Ray Williams is a wonderful example of how, through his selfless dedication to our sport and its character-building values, rugby can change lives, bring people together and provide tremendous camaraderie. He is a worthy winner of this prestigious award as someone who changed for the better the way the game was coached while also managing to stay true to the game's core values."